Without telling her family, Elyria takes a one-way flight to New Zealand, abruptly leaving her stable life in Manhattan, her home, her career and her loving husband. As the people she has left behind scramble to figure out what has happened to her, Elyria embarks on a hitchhiker’s odyssey, testing fate by travelling in the cars of overly kind women and deeply strange men, tacitly being swept into the lives of strangers, and sleeping in fields, forests, and public parks. As she journeys from Wellington to Picton, Takaka, Kaikoura and onwards she asks herself, what is it that I am missing? How can a person be missing? 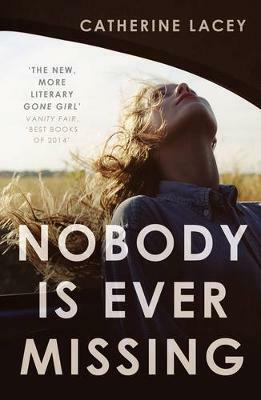 Full of mordant humour and uncanny insights, Nobody Is Ever Missing is a startling tale of love, loss, and the dangers encountered in the search for self-knowledge. It is a novel which goes far beyond the story of a physical journey and asks what it means to be human, to be a woman, and to be at the mercy of forces beyond one’s own control. Catherine Lacey’s impressive first novel follows 28-year-old Elyria who, without telling her husband, boards a plane from New York to New Zealand leaving behind her stable and outwardly enviable life. Seeking to ‘divorce from everything, to divorce my own history’, she travels down the length of New Zealand, hitch-hiking her way to the house of a man she has only met once and whose offer of a place to stay she suspects ‘was one of those things a person says on impulse and then aggressively defends to mask the mistake’. She travels with a destination, but without purpose. We, the readers, reside in her head as she dips in and out of the lives of the people she meets on her journey south. Elyria is a woman on the brink – of society, of her sanity, of reality. She is disengaged and detached but Lacey equips her with uncanny insights and dark humour. There are moments in this novel when the skill of Lacey’s language makes you pause. Particularly in the way that she articulates the trap of domesticity, the vulnerability of being a woman alone in the world and the feeling, that many of us have, of wanting to walk away from our own lives. Her use of long, luxurious sentences is often masterful and watching them unfold is the central pleasure of reading this novel. It is a blistering portrait of a woman adrift and a penetrating examination of domesticity and alienation. A novel that, while pervaded by melancholy, is punctuated with comedy and moments of electrifying insight. Brigid Mullane is a freelance reviewer.